This past Thursday the Citron Campus was taken over by ghosts, ghouls, and princesses! We have never seen such a variety of costumes. Every child walked around the elementary yard in our annual Halloween Parade to show off their costumes to family and friends. Afterward they all danced to a Michael Jackson montage for all the parents who attended. We would like to give a big thanks to all our staff and parent volunteers that helped make our campus look so spooky and ensured the children had a great time with all of our Halloween activities. Operation Candy Drive started off Monday. We have a collection box in the lobby until Friday, November 5th. We hold the drive around Halloween and collect extra, unused Halloween candy for the servicemen and servicewomen in the military. Please feel free to donate any store bought candy or extra Trick-or-Treating candy. On Tuesday, November 2nd, all students will have the opportunity to vote. The children will make a tough choice between an ice cream party or a donut party. We want our students to understand the importance of voting and making their voice heard, just as many adults will also do that day. There's more to wearing scarves than being fashionable—they help prevent colds! Join Laura Metzdorf, licensed acupuncturist from The Healing Sanctuary (North Tustin) and author of CultivateYourWellness.com for helpful hints on how to keep your family healthy this winter. Topics include natural remedies for prevention and treatment of common cold weather symptoms. First 5 RSVP’s will receive a gift bag of immunity- boosting herbs and other samples. On October 11th, our sixth grade students went to Outdoor Science School in the San Bernardino Mountains. The students departed Monday morning and arrived shortly before noon. Little did they know what would be in store for them over the next week. Upon their arrival, students joined their cabin instructors and fellow cabin mates, and the week was on its way. The week consisted of hiking along exciting trails that provided the students with an opportunity to learn about the forest and animal life surrounding them. On these hikes, knowledge was taught and information was shared by teachers, instructors, and students. The hiking highlights of the week included the Night Hike and the Astronomy Hike, which allowed the students to explore the wilderness trails by means of their rarely-used night vision. In addition to the outdoor activities, students also performed in skits and attended a hoedown. Skit night, where each cabin performed a skit based on the theme of the week, "Out of this World!" produced some hilarious acts that involved crazy costumes and wild personalities. Rumor has it that the Fairmont teachers produced, directed, and starred in their own little skit involving a candy store and a few suckers! At the hoedown, the students kicked up their heels and did some line dancing. The students smiled and joked as they learned new dances while stumbling and bumbling to the music. Outdoor Science School is part of the sixth grade curriculum. It gives the students the opportunity to learn in a majestic setting six thousand five hundred feet above sea level. A diverse range of topics including geology, astronomy, and ecology are studied throughout the entire week. Working together is a key theme at Outdoor Science School. In the cabins and at meals, students are asked to put away thoughts of "me" and to start thinking about "us." It is truly a memorable week that the students reminisce about the entire year. Mable parents are invited to attend the Prep's Peer-to-Peer Day Parent Hour which takes place in the Prep Library from 9:00 - 10:00 am. There, parents will be served a continental breakfast and hear from Headmaster Mr. Mendoza, Counselors, Prep parents, students and administrators. Peer-to-Peer Day Parent Hour is a great event for those who were not able to attend the Prep's Information Night. Please RSVP to Sylvanda Edwards, Admissions Counselor at the Prep at sedwards@fairmontschools.com. This week was Red Ribbon Week and we all had an opportunity to talk about the dangers of drugs and to pledge to be drug-free! We had WEAR RED day on Monday, TEAM Up Against Drugs on Tuesday, Acts of Random Kindness on Wednesday and CAP drugs on Thursday. This week all the pre-schoolers planted a garden in the corner of their playground. They had so much fun learning about planting their seed! The pre-schoolers planted sweet peas, sunflowers, and marigolds. They are very excited to see them all start growing. Check it out if you are on the playground! First Grade went on the first field trip of the year! They saw “Miss Nelson Is Missing” at the Ebell Theater in Santa Ana. They had a great time and loved the show! Fourth Grade had a “Walk Through California” program. This is a wonderful program for the 4th graders learning about California, as they can actively participate in the lesson. They wore costumes representing the historical beginnings of our great state, and as the presenter told the history the students jumped up and recited what they have learned about their topics. Everyone had a great time! 5th Lauren L. and Nicky C.
• On balance, advertising does more harm than good. • The United Staes should reinstate the draft. • Junk food should be banned at schools. CONGRATULATIONS TO THE JUNIOR HIGH DEBATE TEAM!!! Play-Offs start next week, with our Tri-Way Football team seeded #2 with a record of 10-1. They will play the # 7 seed, the TVT Lions on Monday, November 1. We are hopeful that the Cougars will make it to the finals on Thursday!! Come and cheer them on! Play-offs for Girls Tri-Way Volleyball team starts on Monday, November 1. They are also the #2 seed with a record of 10-1. They will take on Pegasus at Pegasus, the #7 seed. It was a great week for the DSL Football and Volleyball teams! The boys football team defeated Oakridge 18-12 for their first victory!! They were very pleased with their progression and far they have come in learning the game of football. Thank you to Coach John Yakel for his wisdom and patience with the team, and teaching the team about winning and losing with sportsmanship! The girls volleyball team also defeated Oakridge! 25-15, 20-25, 15-8. Coach Marcus Arias enjoys watching the girls develop their skills and sportsmanship. They are really getting the hang of this fun sport! Marie V., Aryanna B. and Jessica C. played great in game one with clutch serving from Vera W. to win the first game for the Little Cougars! Naomi M., Kaleigh P. played tough in game two, falling to Oakridge in this game. Jessica C. served from an 8-8 tie in game to 15-8 helping the team win the match! Josie P. had a amazing ace during this tough match! The first graders were presented with a slide show of fascinating pictures, maps, and vocabulary of England from Liam's dad. Mr. Leathem kept the students engaged not only with his slide presentation but also with his queried prompts to elicit answers! The first graders found the variance in vocabulary words quite fascinating, as Mr. Leathem chose words of interest for our young students. Trainers, trolleys, and crisps may be words coming home from your child. Of course, there is nothing greater than treats or, "sweets," as they are known in England. We had a wonderful sampling of these delicious sweets brought straight from England for our enjoyment. We had the privilege of hosting an Australian teacher, Ms. Deidre, who resides in England to come to our classroom and speak about the land down under. Students learned about the harsh climate of Australia and how growing up in Adelaide was hot and dry. She also spoke on the native Australian animals such as the kangaroo, the platypus, the funnel spider, as well as the wombat. She even gave our class a book! The book is called Wombat Walkabout which is about a little wombat from Australia who loves to "dig and think." On top of that, she brought in some typically Aussie food for us to sample. Some liked the Vegemite, while most stuck with the yummy cookies. Mrs. Lottes' students walked away with a better understanding of the huge island (as they called it) of Australia. On Monday, Oct. 25th, as a closure to the first grade studies about Community Helpers, they received a visit from Officer Bradbury of the Costa Mesa Police Department. The first graders were able to learn about being a police officer and what it takes to be a wonderful contributor to all communities. Their visit wouldn't have been complete without a trip outside to explore the inside of Officer Bradbury's police car! Thank you, Officer Bradbury (and Miss Kim for sharing your sister with us)! 8th grade students will be transported to the Prep by bus from Edgewood and will be guided by Prep Student Ambassadors as they experience first-hand what it's like to be a Husky both in and out of the classroom. Faculty, counselors, administrators and coaches will be on hand to welcome the Edgewood 8th grade class. This event takes place during the Prep's annual Spirit Week activities leading up to our Homecoming game on Friday, November 5th. Everyone is encouraged to dress according to theme which is the Happiest Homecoming on Earth! Each day's theme is centered around a unique Disney attraction. Wednesday, November 3rd is Haunted Mansion Day and students may dress up as zombies, vampires, ghosts or the scariest apparel they can find. Lunch will be provided and students will get to participate in fun lunchtime activities including our very own Haunted Mansion in the Prep gym before returning back to the Edgewood campus at 12:30 pm. Edgewood parents are invited to attend our Peer-to-Peer Day Parent hour which will take place in the Prep library from 9 - 10 am only. There, parents will be served a continental breakfast and hear from Headmaster Mr. Mendoza, Counselors, Prep parents, students and administrators. This is a great event for those who couldn't make it to Prep Info. Night. Please RSVP to Sylvanda Edwards, Admissions Counselor at the Prep at sedwards@fairmontschools.com. Edgewood is a tech savvy campus, and we are pleased to offer Tech Tuesdays to Edgewood parents in order to provide them with a better understanding of the programs Edgewood teachers and staff use daily. The Tech Tuesday classes will include: Blackboard, Net Classroom, Social Media (Fairmont Website, Facebook, Flickr, Fairmont Blog, eNewsletter), AR, AM, and Promethean Board presentations on the dates above. See you there! Stephanie S. is a Mable campus fourth grader who has been swimming since she was 1½ years old. “I love to swim, my favorite strokes are butterfly and freestyle,” she says. Stephanie’s coach says that Stephanie takes her swimming very seriously and is like a fish in the ocean. Stephanie, who swims for the Anaheim Aquatics Association, is on her way to making her dream of competing in the Olympics come true. She has won numerous ribbons and medals including the Coach’s Award in 2009 and the Most Valuable Swimmer of 2010. Stephanie hopes to one day meet superstar swimmer, Michael Phelps. The Cougars ran their record to 3 and 1 with a victory over Oakridge. The defense held tough only giving up two late scores by Oakridge. The offense was led by Cole M. who completed over 50% of his passes. One a 45 yard touchdown pass to Hassan A. The ground game was working for the Cougars as well. Matthew W. got the cougars on the board with a 50 yard touchdown run on a reverse. The final score of the game came when Andy C. busted out a 35 yard touchdown run on a quarterback draw. The big key for the Cougars defense was the great rush put on by the defensive line which included, Elias A., Kyle K. and Kevin K.
On Saturday, October 23 at The Pegasus School in Huntington Beach, Mable’s Speech and Debate team competed in their first debate of the season. The tournament was a “scramble” which means that Mable students were mixed into 3-person teams with students from other schools. Topics of the debate included “Junk Food Should Be Banned at Schools” and “The United States Should Reinstate the Draft.” Meeran I.’s team won a top team award and Emily L. (in her first debate) and Vasiliki C. won top speaker awards! The Mable Speech and Debate team is coached by Mrs. Karen O’Hanlon and made up of the following students: Nick P., Meeran I., Nelson L., Emily L., Ryan H., Joshua C., Kaitlynn C., Justin L., Liza M., Meera M., Vasiliki C., and Dev S. We are so proud of this awesome team and wish them all the best in their future competitions! The Cougars are roaring toward the play-offs! With three victories in a row this week, the team is really coming together on offense and defense! The Cougars beat the Calvary Eagles 32-24, they beat Heritage Christian 26-6, and Carden Acedemy 42-8. The Cougars will be back on the field on Monday, October 25 at Oakridge at 3:00pm for the final regular session game. The play-offs start Monday, November 1! Mable’s Junior High Volleyball Team pulled off a great victory against Edgewood! This win was needed to solidify a playoff position, making the victory even sweeter. The match opened up with a very tight game one, and the Panthers actually lost 24-26. We were determined to rally back and took game two 25-20. The deciding game always moves quickly. The Panthers built a little cushion, going up 10-6; but the Edgewood Eagles fought back and tied it 12-12. With some great serves from Lauren H., we closed game three with a 15-13 win, the final point coming from one of Brianna P.’s well placed hits. On Wednesday, October 27th, the Lady Panthers will work hard in a double header at Pegasus School. Due to weather conditions earlier, some games had to be moved around. We will first face Pegasus, and then immediately play against Heritage Christian at Pegasus. These back to back games are necessary in order to determine the playoff order.Wish us luck! The better we do on Wednesday, the better playoff standing we have! The Panthers were led on offense by Brando P. as he scored two touchdowns in this close game! Unfortunately the Eagles came out ahead, winning by four points. We'd like to commend Shawn Y., Matthew T. and Nomin P. for their excellent defense! The offensive was helped by strong games from Tanner L. and David K. See you at the next game! On October 7th, the preK – K children at Citron enjoyed an interactive presentation on nutrition. Using the book Eating The Alphabet by Lois Ehlert as a visual guide, the children participated with great enthusiasm in guessing the name of a fruit or a vegetable that began with the letter A, B, C, etc. B was for banana, blueberries and yes, even broccoli. The children said that they LIKE broccoli. Hmmm I wonder if their parents would agree. That would be great! C was for carrots, cherries, and corn. D was for Dates (that was a hard one). Can you guess what vegetable begins with the letter “E”? Hint: it’s a type of lettuce. The older children made it all the way to “F”. The presentation concluded with the song, “Five a Day” emphasizing eating five servings of fruits and vegetables every day. There was lots of singing and even dancing to the music. We all had fun, and I look forward to presenting again in November at Fairmont! The Watsons Go to Birmingham-1963 is a Newbery award winning book written by Christopher Paul Curtis. 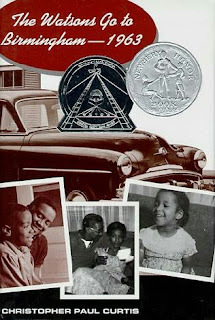 It is a hilarious story about an African American family, who call themselves "the weird Watsons." Due to the antics of the older Watson brother, the family travels south during a tragic time in American history. Although they face tough times, the family grows closer together, keeps a sense of humor, and shares a lot of love. 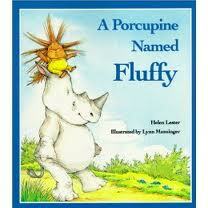 Fluffy the porcupine is not happy with his name. He makes several attempts to change himself so that he better fits his name. He is unsuccessful and frustrated. Eventually, he meets a rhinoceros that is also misnamed. They become friends because of their names. This is a fun book to read with your children at home and reinforce language arts skills by talking about synonyms and antonyms. For example, imagine another animal, like a giraffe. Then have your children think of words that describe a giraffe like tall, thin, and long neck, and words that are the opposite like short, wide, etc. 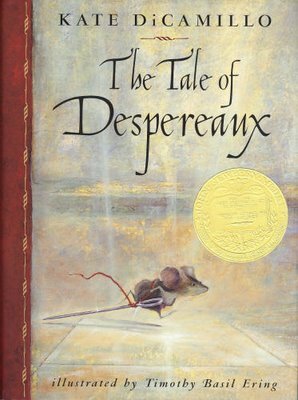 This is the story of Despereaux Tilling, a mouse in love with music, stories, and a princess named Pea. It is also the story of Miggery Sow, a slow-witted serving girl with a simple, impossible wish. These characters are about to embark on a journey that will lead them down into a horrible dungeon, up into a glittering castle, and ultimately, into each other's lives.